Bali Botanic Garden (Indonesian: Kebun Raya Bali) is a large tropical botanic park in Bali located in Bedugul region, Candikuning Village, Baturiti District, Tabanan Regency, in the central highland of Bali island about 56 km from Denpasar City. Bali Botanical Garden Bedugul was formerly known as Eka Karya Botanical Garden, is located at an altitude of 1250-1450 above sea level, with an area of 157.5 hectares. The average temperature in Kebun Raya Bali is 17° - 25° C during daytime and 10° - 15° C at nighttime, with the humidity of 70 - 90%. Because the weather is hard to predict, visitors are advised to always prepare warm clothes, umbrella or raincoat. To reach the location of Bali Botanic Garden, visitors are advised to use taxi, car, motorbike or tourist bus because public transportation is not convenient due to the irregular schedule. The other places of interest nearby Bali Botanic Garden or surrounding Bedugul area are Ulun Bratan Danu Temple, Beratan lake and Bedugul's fruits and vegetable market. Bali Botanical Garden is a unique place on the island of Bali which combines botanical research, plant conservation, education, and recreation. Here we can relax and enjoy the beauty and peacefulness while learning the benefits of many kinds of plants, such as plants for medicines, the plants for ceremonial purposes (materials to make offerings in the Balinese Hindu religion), and other various tropical rainforest plants and bird life. The history of Bali Botanic Garden was started by the idea of Prof.Ir. Kusnoto Setyodiwiryo, President of the Board of the Environmental Research Center who is also the Head of the Indonesian Botanic Gardens, and I Made Taman (the Head of the Board of Environmental Conservation and Preservation), to set up a branch of the Botanical Gardens outside Java, in this case, is Bali. Approach to the Provincial Government of Bali starting in 1955 until finally in 1958 the authorities in Bali is officially offering to the Board of the Environmental Research Center to establish the Botanical Gardens in Bali. 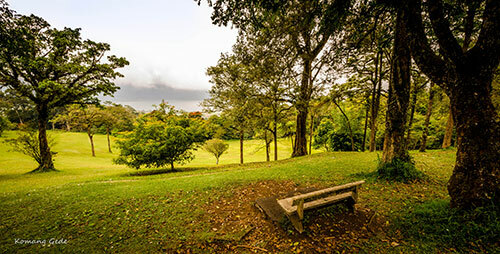 Under the agreement, specified location of the Botanical Garden covers an area of ​50 hectares of forest and reforestation Candikuning directly adjacent to the Nature Reserve Batukau. Right on the date of July 15, 1959, "Eka Karya" Botanical Garden was inaugurated by Prof. Ir. Kusnoto Setyodiwiryo, Director of the Institute for Nature Research Center as a realization of the decree of Head Regional Level 1 Bali 19 January 1959 No. 19/E.3/2/4. The name "Eka Karya" for Bali Botanic Garden proposed by I Made Taman. "Eka" means One and "Karya" means the Work Results. So "Eka Karya" can be interpreted as the first botanical garden which is the result of the Indonesian nation itself after Indonesian independence. This botanical garden is devoted to collecting gymnosperms (needle-leaved plants) from all over the world because these types can grow well in the botanical gardens. Many of the first collection were imported from Bogor Botanical Garden and Cibodas Botanical Garden, among others are Araucaria bidwillii, Cupresus sempervirens and Pinus masoniana. Other types of plants that are native to this area included Podocarpus imbricatus and Casuarina junghuhniana. Since opening, the development of "Eka Karya" Bali Botanic Garden always have a situation up and down with the alternation of management, between Bali Provincial Forest Service and the management of Botanic Garden itself. Bali Botanic Garden have been managed for 2 times by Bali Provincial Forestry Office, on 15 July 1959 - 16 May 1964. And after the events of the G 30 S / PKI (1966-1975), the management of the gardens directly by the botanical garden staff itself for 2 periods, since 16 May 1964 - December 1965 and 1 April 1975 until now. From 1964 until today, the "Eka Karya" Bali Botanic Garden has experienced 11 times changes in leadership with various renewal. Under the leadership of I Gede Ranten, B.Sc (1975 - 1977) botanical gardens expanded until 129.2 hectares. The expansion was inaugurated by the Chairman of Indonesian Institute of Sciences Prof.Dr.Ir. Tubagus Bachtiar Rifai on 30 April 1976 and was marked by the planting of the plant Chamae cyparis obtusa. Under the leadership of Ir. Mustaid Siregar, M.Si (2001 - 2008) botanical gardens expanded again to become 157.5 hectares. Although at the beginning of the establishment devoted to the conservation of coniferous plants (gymnosperms), the Bali Botanic Garden located at an altitude of 1250-1450 m above sea level with temperatures ranging between 18-20 ° C and humidity of 70-90 % is developed into the conservation of tropical mountains plant of eastern Indonesia. The current status is the Technical Implementation Unit Botanical Garden Plant Conservation Center "Eka Karya" Bali (Decree of the Head of Indonesian Institute of Sciences No. 1019/M/2002, 12 June 2002) and the Special Purpose Zone as Forest Education and Research for allotment of botanical gardens "Eka Karya" Bali (Decree of the Minister of Forestry Indonesia No. 252/Kpts-II/2003, 28 July 2003). With a collection of thousands of plants that are not only from Indonesia, the Bali Botanic Garden is a suitable place for research, education, and tourism. More than 2000 species of plants are preserved at this huge botanical park, represent plants from mountain areas of the eastern Indonesia: Bali, Nusa Tenggara, Sulawesi, Maluku, and Papua. New plants are acquired from commercial nurseries, arboreta, from the other botanic gardens, plant breeding programs, and collecting expeditions. The collections of plant found in Bali Botanic Garden are ferns and mosses, orchids, begonias, cactus, plants for medicines, plants as materials for religious rituals of Balinese Hindu, aquatic plants, bamboos, Rhododendron, Araceae, Herbarium, and also bird watching with more than 79 species of birds that live wild in the Bali Botanic Garden. The institution offers a number of scientific services and facilities in support of plant research and conservation, including herbarium, seed bank, library, glasshouses, nursery, and plant database.